My Weather is a free Windows 8 Weather app that gives you weather forecast of your local area or any other city around the world. With this app, you can get updates of current day weather and also the forecast for next four days. This free Windows 8 Weather app is very well designed, neat, and directed to appropriately serve the purpose. It is extremely simple to use as well. The weather details of your local area are displayed on the app’s screen by default. However, you can search for the weather details of any other city around the world using the app. It displays weather details, such as maximum and minimum temperature, details about rain, wind speed, and wind direction. With a nice picture and text, it also tells if the day will be sunny, partly cloudy, or cloudy. The Settings option in the app lets you set unit for measurement of temperature and wind speed. You can enable live tile updates and allow the app to run in the background of your lockscreen. My Weather is freely available in News & Weather category of Windows Store. You can view the app directly in Windows Store using the link given below at the end. Let’s see how this free Windows 8 Weather app works. 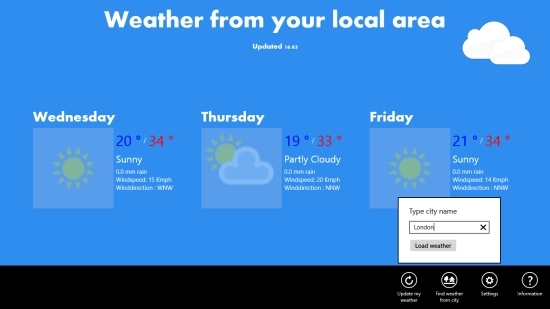 This free Windows 8 Weather app is a simple and quick tool to get weather details. The interface is completely ad free and looks beautiful. Be sure to have an active internet connection while you use the app. As you launch the app, it will ask for your permission to use your location. Click on Allow. The next screen will display weather details of your local area for the current day. You will also see the weather forecast for the next four days on the screen. As you right click on the screen, the app bar will display various options: Update my weather, Find weather from city, Settings, and Information. As I mentioned earlier, you get weather information of your local area on the app’s screen initially. But, you can search for the weather details for any place around the world. To do so, click on Find weather from city option and enter the desired city name. The app will instantly display weather details of the current day and next four days for that city. You can click on Update my weather option to get back to the local weather screen. The app also gives you the choice to select measurement units for temperature and wind speed. By clicking on Settings option, you can select to display temperature in Degrees or Fahrenheit and wind speed in Kilometres or Miles. Settings option also lets you enable/ disable live tile that will update temperature of your local area after every thirty minutes (approximately). Similar apps: Weather Capture, Ambient Weather, and Vieather. My Weather is a nice Windows 8 Weather app capable of showing weather forecast of any place around the world for the current day and the next four days. The interface is quite impressive and user-friendly. The Information option gives a brief review of the app to make it even easier to understand how the app works. Try this app and share your feedback via comments.